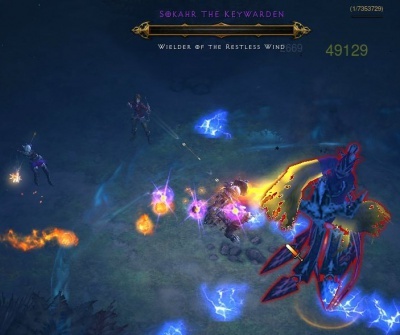 Sokahr the Keywarden is a Dune Dervish Elite monster added in Patch v1.0.5. This monster can be found somewhere randomly-located in the Dahlgur Oasis level in Act Two, on Inferno difficulty. Sokahr has a chance to drop the Key of Hate, an item required for the Infernal Machine end game event. Prior to v1.08 Sokahr and the other keywardens could be found on any difficulty level, though they only dropped keys on Inferno. In v1.08 and later the keywardens only appear on Inferno. Sokahr always has Vortex and Missile Dampening as his Elite Affix, which gives him some resistance to ranged attackers, as well as making him easier to spot from a distance. Magic Find does not increase the chances of the keys dropping. though it does affect the other items the Keywardens drop, and they can be an excellent source of Rares or Legendaries. This page was last edited on 8 April 2015, at 12:05.